Spelt is an ancient grain related to wheat. 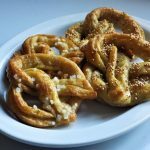 Contrary to what some believe, it is not gluten-free like many other ancient grains. It can be a little hard to find so check your specialty aisle in your grocery store or try a store like Whole Foods or an ethnic grocer. 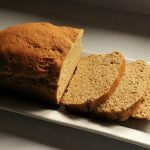 Spelt has a distinctive, nut-like taste and is very high in nutrients. 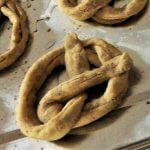 It also makes a great pretzel. 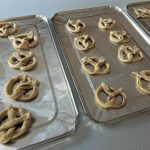 For this recipe we’re going to use the bread machine to make the pretzel dough using the basic dough setting. 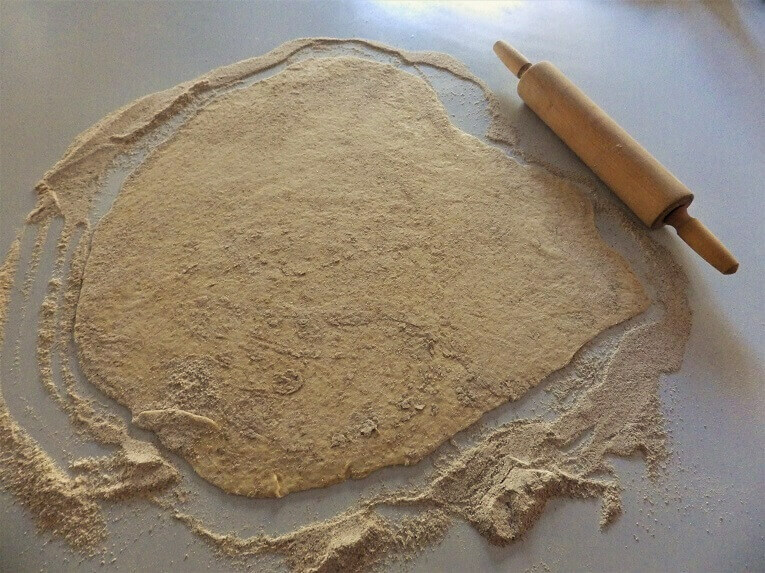 Once the dough is ready, we’ll roll the dough out and cut it into strips before rolling and forming the dough strips into long strands. 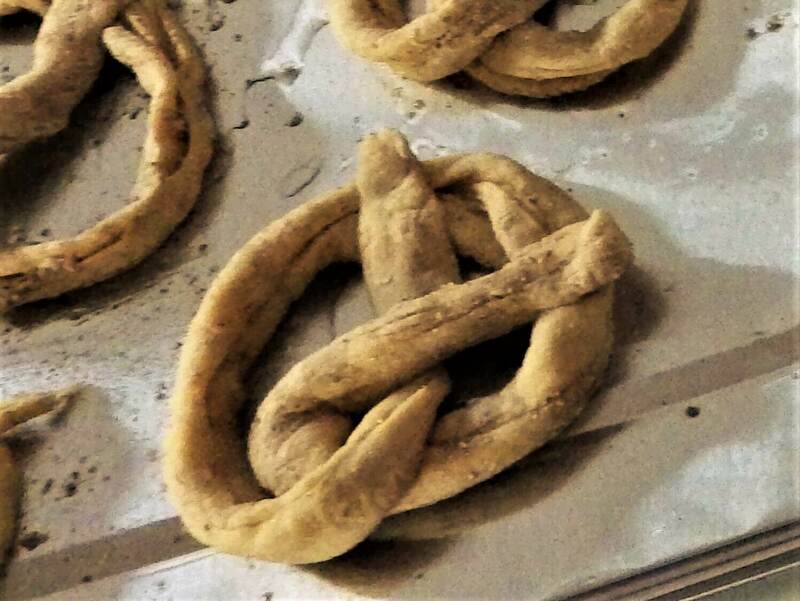 Once we have the strands we can easily make a pretzel shape by forming a loop and crisscrossing the ends onto the top of the loop. 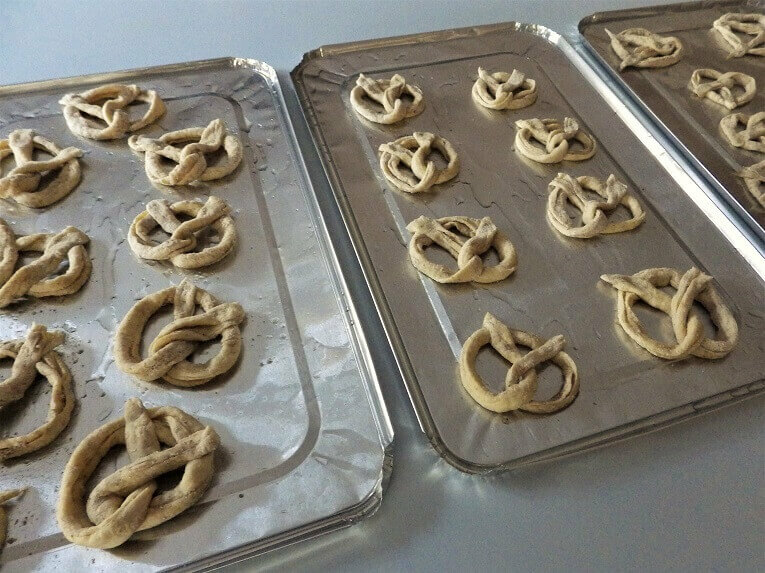 There are some additional steps that might be unusual to you if you’re never made pretzels before. 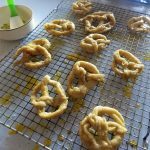 One of those steps involves quickly dropping the raw pretzels into boiling water and flipping once for a total of about 30 to 45 seconds. 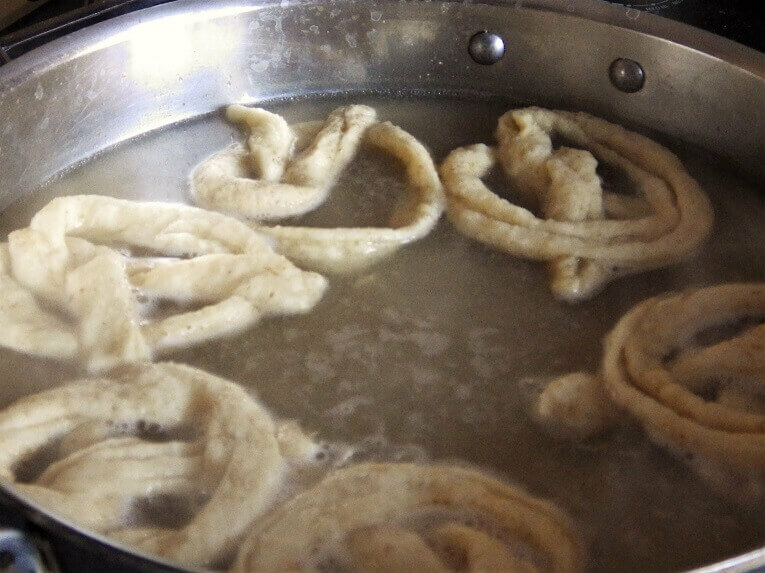 This hot-water boil is similar to the prep step for bagels. 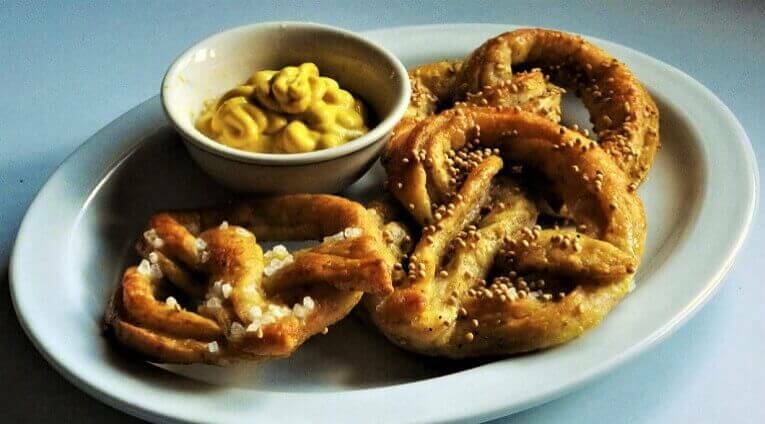 After the raw pretzels have been boiled they are allowed to dry on a wire rack, coated with an egg yolk wash and then sprinkled with your choice of toppings. 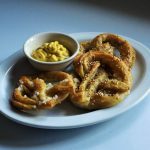 Coarse salt is a favorite, but you could also sprinkle with sesame seeds, mustard seeds, poppyseeds or caraway seeds. 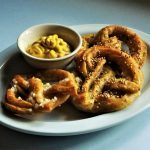 There’s no limit to what you can use to top your pretzels from cracked, black pepper to chopped garlic to brown sugar and cinnamon. 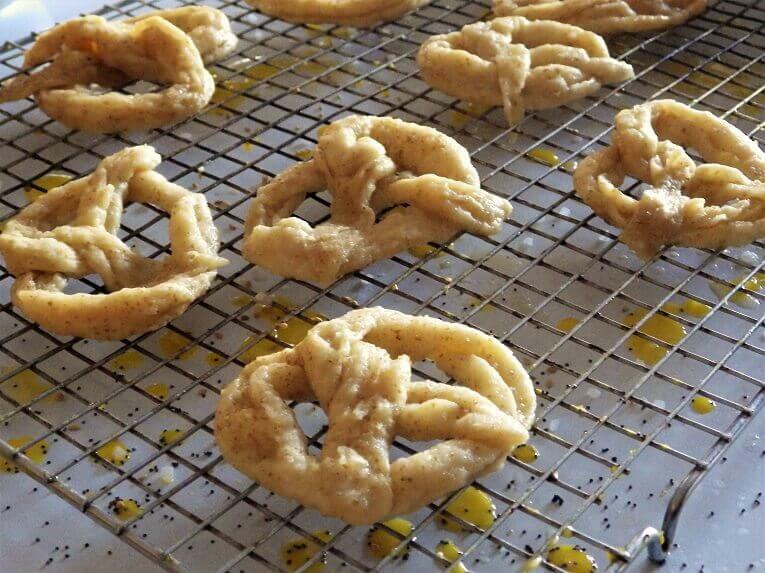 Once the pretzels are prepped they’re finished in the oven at 350 degrees Fahrenheit or 176 degrees Celsius for 15 to 20 minutes or until they have browned to your liking. 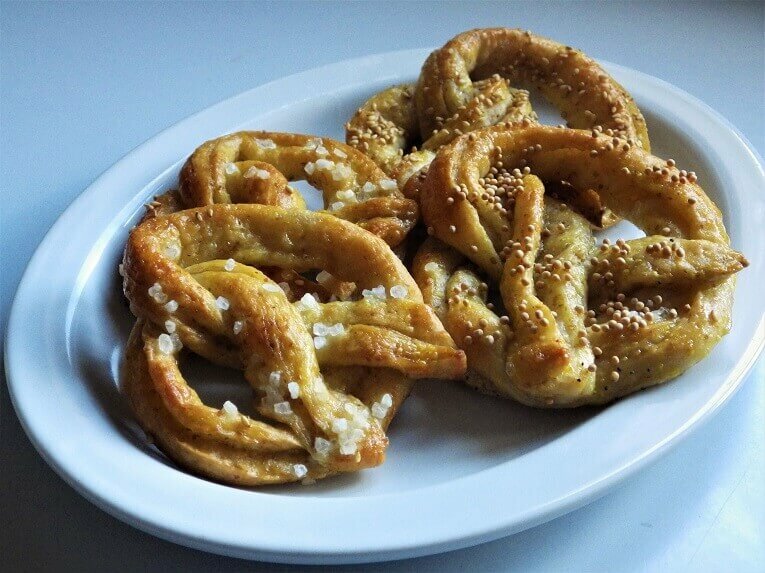 This recipe results in something referred to as a “soft” pretzel. 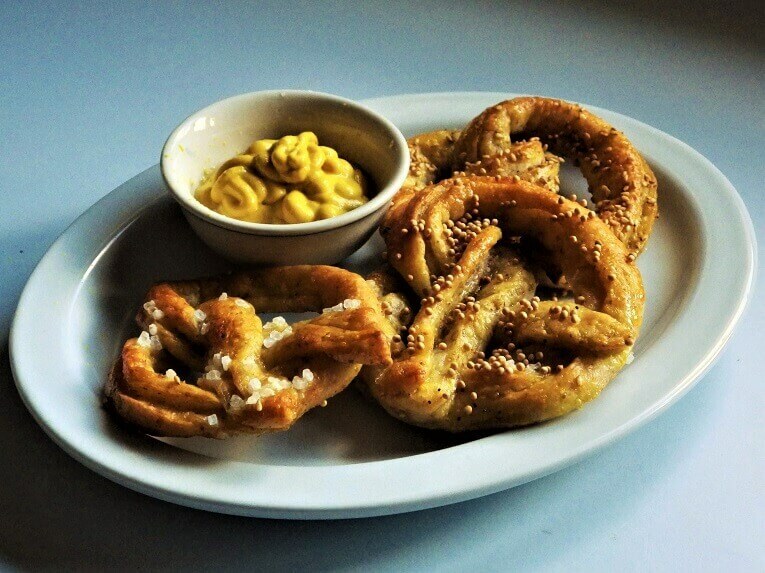 Many people dip them in their favorite mustard, but any other dip will do depending on your taste. They’re also good as is. 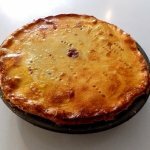 Place all of the ingredients in the bread machine in the order indicated in the ingredients section of the recipe and select the basic dough setting. 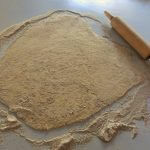 When the dough is done, dump out of the bread pan onto a lightly floured surface. 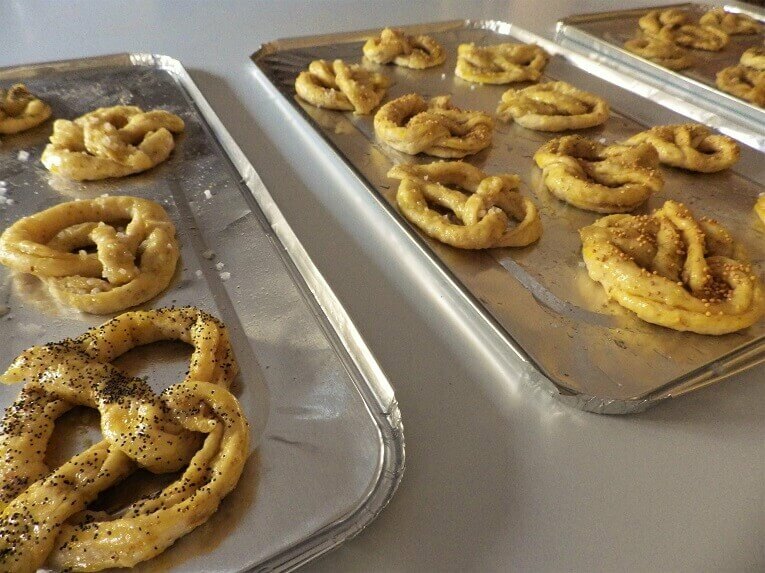 Preheat the oven to 375 degrees Fahrenheit or 176 degrees Celsius. 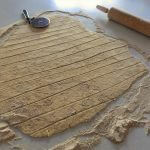 Using a rolling pin, roll out the dough to a thin sheet. Cut the sheet into long strips about an inch wide. 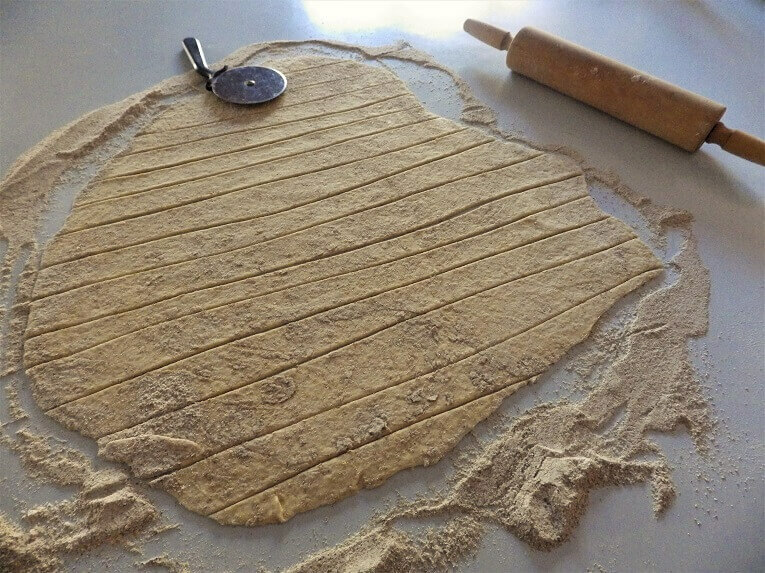 Roll the strips forming dough strings. 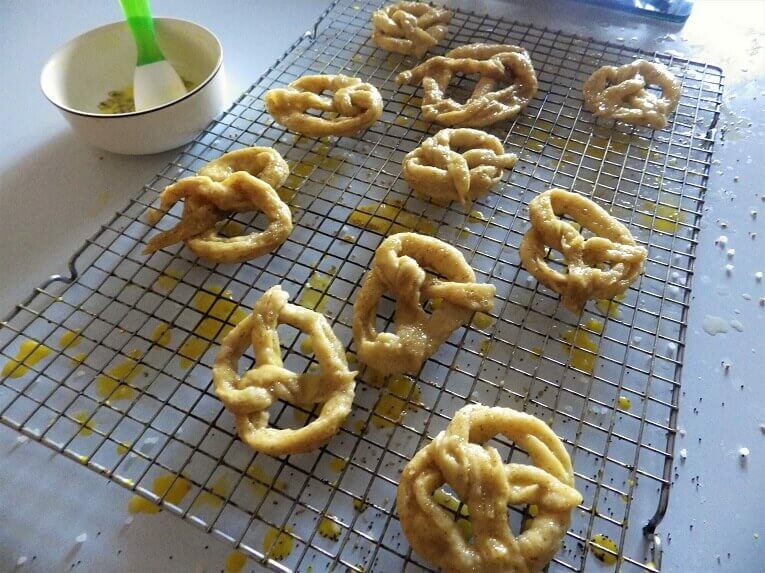 Form the stings into a pretzel shape. 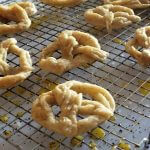 Bring a large pot of water to a boil and drop the pretzels into the boiling water a few at a time. 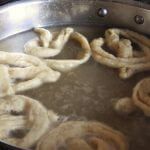 Flip in the water with a slotted spoon after 15 to 20 seconds and boil for another 15 to 20 seconds. Remove from the boiling water with the slotted spoon and let dry on a wire rack. 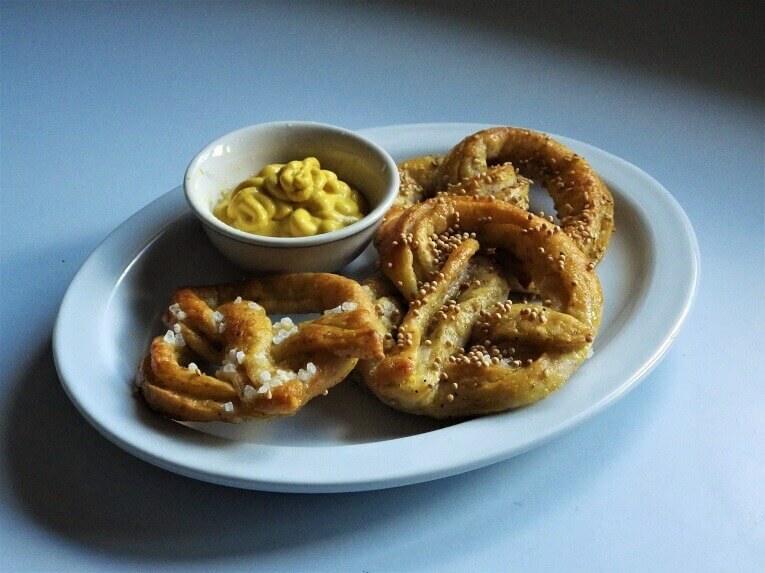 Glaze the pretzels with the egg yolk wash.
Sprinkle your choice of toppings onto the raw pretzels. 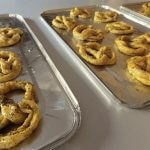 Bake on a lightly oiled cookie sheet for 15 to 20 minutes or until browned to your liking. 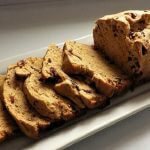 Remove from the cookie sheet and serve immediately or reserve for later.